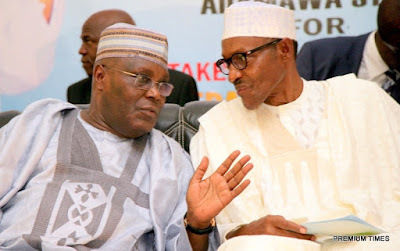 Home / Politics / Ex-vp Atiku attack President Buhari say "I’m a job creator Unlike you"
Ex-vp Atiku attack President Buhari say "I’m a job creator Unlike you"
The campaign office of Atiku Abuabakar has described the opposition presidenital candidate of being a job creator. The office also took a jibe at President Muhammadu Buhari saying he has never run a successful job creating enterprise. “Now we urge the Buhari Presidency and the APC to mention even one successful private endeavour that the president has successfully run. And by private enterprises, we are not referring to 150 cows that never increase in number, year in year out,” the campaign office said. The open, democratic and free and fair election (something alien to the APC according to Buhari’s own wife) on Sunday of His Excellency, Atiku Abubakar, Presidential candidate for the PDP, has clearly left the All Progressives Congress in a state of panic and confusion. On Sunday, the Buhari Campaign Organisation launched the first weak salvo. And on Monday, the APC’s National Publicity Secretary unleashed his own knee-jerk reaction, accusing His Excellency, Atiku Abubakar, of being desperate. Our response to the APC is to ask who is desperate between a Muhammadu Buhari who said “If what happened in 2011 should again happen in 2015, by the grace of God, the dog and the baboon would all be soaked in blood” and an Atiku Abubakar who said “Love and peace should not only be preached, but must also be put into practice for the sake of sustaining the peace in our land”? It is left for Nigerians to judge, but even a blind person can see that Nigeria has been “soaked in blood” ever since she was unfortunate enough to have fallen under the rulership of a man whose words are destructive and never productive. That is a very easy question to answer and we will answer it now. Some of HE Atiku Abubakar’s achievements as Nigeria’s Vice President are that as head of the National Council of Privatisation, he superintended over the GSM revolution that saw Nigeria go from 50,000 to 100 million GSM lines, has added 500,000 direct jobs to the Nigerian economy and attracted $27 billion to our GDP. Our question to President Buhari and the APC is how many jobs have they created? Another of HE Atiku Abubakar’s achievements is the successful privatisation of many public enterprises that hitherto consumed government resources without yielding profit. In response, we ask President Buhari how many loopholes in public expenditure has he plugged? The spectacular failure of the 419 Nigeria Air is still fresh in the memory of Nigerians. A further achievement of the former Vice President is initiating, starting and completing several road projects all over Nigeria including roads in President Buhari’s home state of Katsina. In return, we challenge President Buhari and the APC to mention three projects that they have initiated, started and completed in the last three years. Finally, the APC spokesman had the guts to question His Excellency, Atiku Abubakar’s source of wealth. We wish to remind APC’s National Publicity Secretary, Yekini Nabena, that Atiku Abubakar is not like President Buhari who has never run a successful private business throughout his life. Unlike Muhammadu Buhari, Atiku Abubakar is an expert job creator who has founded many successful and thriving businesses including the American University of Nigeria, Yola, a Microfinance Bank that has moved 45,000 families out of poverty and Rica Gado, a livestock feed company that has significantly reduced instances of herdsmen/farmers clashes by providing a business-friendly solution instead of asking Nigerians to give up their lands for cattle ranching or face death, as the Buhari government did. Unlike President Buhari, Atiku Abubakar does not believe Nigerian youths are lazy. How could, when 25,000 out of his 50,000 employees are youths? Nigerians should note that we have just listed only a few of the many booming commercial enterprises founded by Atiku Abubakar. Now we urge the Buhari Presidency and the APC to mention even one successful private endeavour that the President has successfully run. And by private enterprises, we are not referring to 150 cows that never increase in number, year in year out. The fact of the matter is that no other candidate is as poised Atiku Abubakar to Get Nigeria Working Again. Nigerians want jobs and Atiku means JOBS. It is no surprise that that is one thing the APC do not want to talk about, seeing as they have lost 11 million jobs in the last three years.